There are only 20 days left ’til Christmas. I have been crocheting like a mad woman! I have lots of ends to weave in, pictures to take, and posts to write, but until then… I wanted to put together a post with the 3 free Stitch11 scarves I have written so far. Each one of these are simply put together with basic stitches. You can turn the regular scarves into infinity or the infinity into a regular scarf. The best thing about crocheting scarves is that you can personalize each one for the person you are gifting it to. 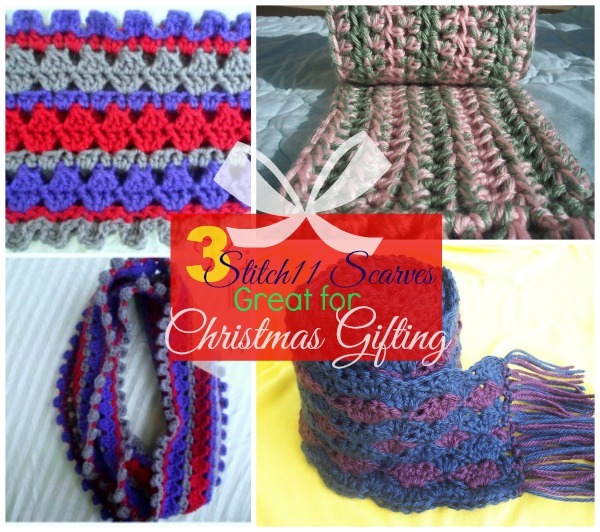 Have fun with your colors, yarns and even hook sizes to get the look just right for each person on your Christmas list. Also check out my earwarmer pattern that matches the Soft and Squishy Scarf!